Good morning readers! And happy day to you all! We’re nearing the end of our school year, and then we’ll be heading out for a nice long summer break! But until then I thought you might like to see what the Teeny Tot is up to. Seriously I have to get her a new name. She’s definitely not teeny anymore. Well, she’s the teeniest one in our house, but I think at 6 I’m going to have to let go and give her a big girl name. Pardon me while I cry for a bit. As most of you know we’re doing a mix of my K4 Kindergarten and the Abeka Kindergarten this year. With some other goodies thrown in for good measure. If you want to see a complete list of what she’s been up to you can check it out in our 2014-2015 curriculum post. 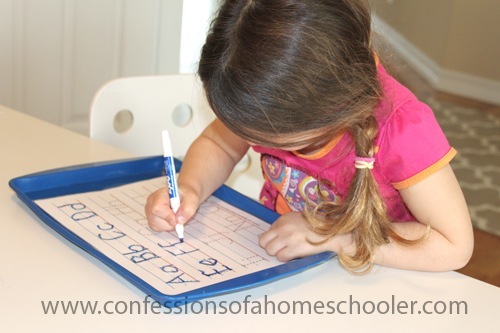 Here she is practicing her handwriting. This is a A-Z, 1-9 Handwriting practice free download on my blog. It also has a blank page so they can practice their name, or whatever else they need to work on. She’s also been practicing her sight words. This worksheet is from my K4 Kindergarten curriculum, and you can download it free here too! 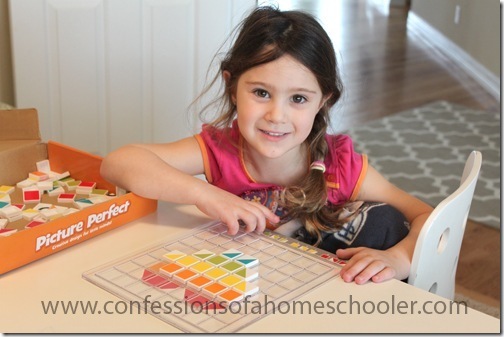 She loves to do puzzles and any hands-on type of activities, so today she pulled out the Picture Perfect game from Educational Insights. We’ve had this for years, but she still loves it. 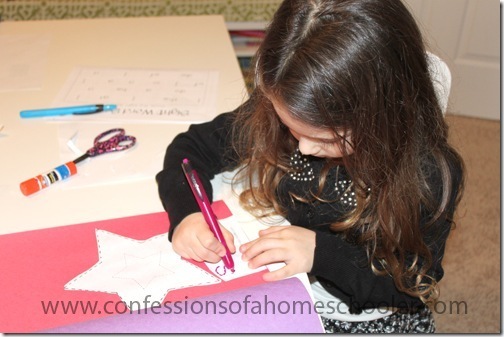 Next she added a shape to her Daily Learning notebook. She’s decided it’s more fun to cut them out and color them, than to trace around the shapes. You can get my Daily Learning Notebook here. And yes, I will be putting out a new one with the 2015-2016 calendar pages on them soon! Like I mentioned she loves puzzles and hands-on stuff, so she always like to add them into her day. This one is from Alphabet Alley and we love them. The pieces are big which helps with little ones, and they’re also really thick and durable too! This one is the In the Beginning Puzzle. My friend Melissa runs Alphabet Alley, so if you head over make sure to say hi for me! 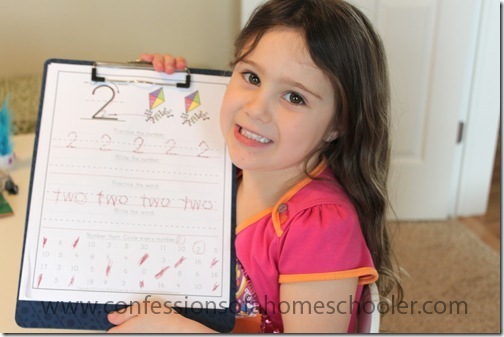 She’s also working on filling in her monthly calendar. This is also part of my daily learning notebook download. 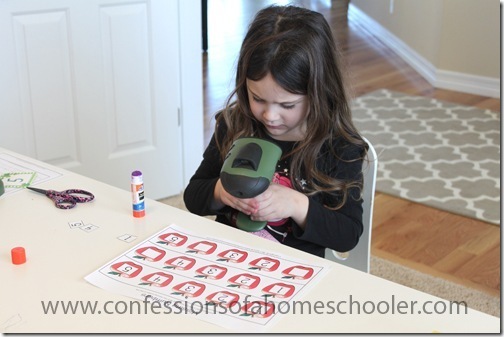 I’m not sure why on earth she would think to take pictures of her doing school…ahem…apparently it’s just part of a blogger kid’s life! Today she decided to take pics with our GeoSafari Tuff Cam. I reviewed this several years ago, and as you can see it’s still gong strong! Oh, and she is also working on one of my K4 Kindergarten missing number worksheets too. She does them because they’re fun. Maybe I should make some with larger numbers? Would anyone be able to use those? Leave me a comment and if there are enough takers, I’ll get on it! And yes, she’s filming herself counting her number chart. What a character. I’m going to miss this when she’s older. Next up is our geo-board. 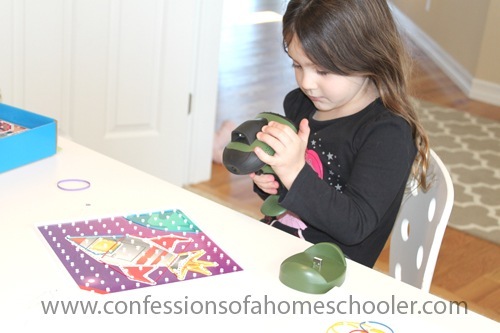 It’s from Lakeshore learning and has a bunch of fun shapes for them to work on. The Geoboard Design Center is a fun way to work on fine-motor skills, creativity, and math skills! My kiddos love using our regular geoboards, and now they can make fun pictures with them as well! The kit comes with 4 peg boards and 20 different mats which progress in ability. And yes, she pulled out her lacing hippo for old times sake. You know, that easy stuff she used to do back when she was just a baby. Here are a few more pics from her walk down memory lane. 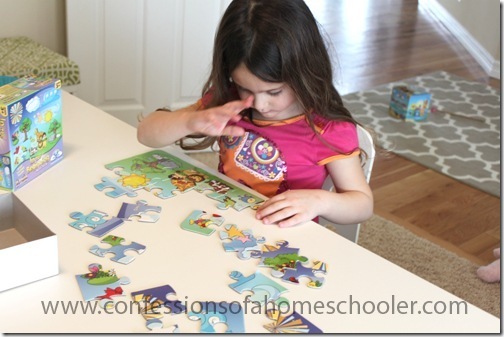 And who doesn’t love the magnet page activities? 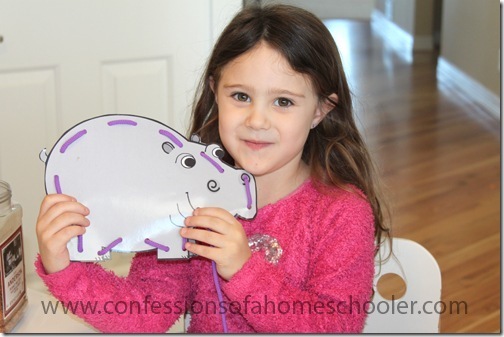 All from my Letter of the Week preschool curriculum if you haven’t seen it before. 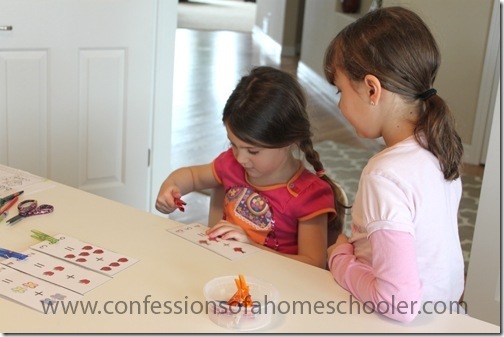 Do your kids love the Do-A-Dot markers as much as mine? The Teeny Tot was just looking for an excuse to use them. 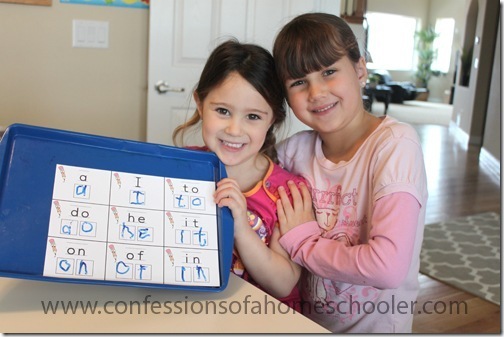 And my K4 Kindergarten Letter Hunt worksheets were just the way to persuade me to let her use them. I mean, what am I going to say? No, you can’t do school? I’m such a sucker. 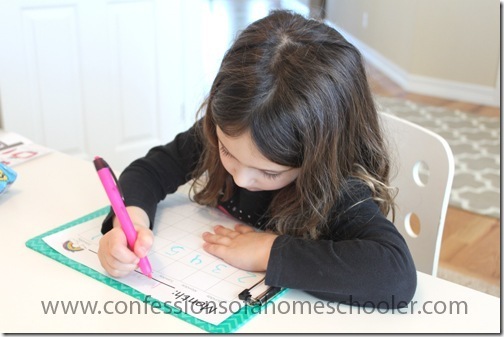 Here she is working on her number writing. These are my kindergarten level 1-20 Handwriting Worksheets. I also have preschool level number writing worksheets here too. 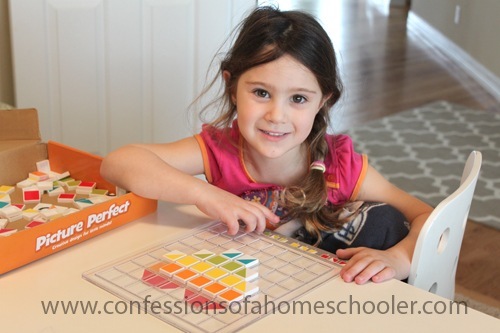 And here she is working on her letter matching. The good thing now is that she can actually read the words too! These are part of my Letter of the Week curriculum, but they still get pulled out for fun. 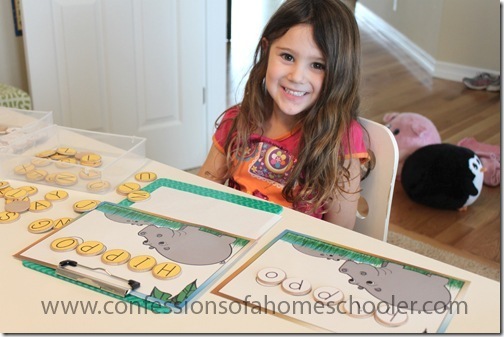 And last but not least, she is working on her K4 beginning math cards. These are fun and she just counts the items, and puts the paper clip on the correct answer. If you have an older child you can also have them write the equation out on paper as well, for example: 3+5=8 and so on. You can download this and many others on my Free Math Worksheets page. And that’s just a little glimpse of what the Teeny Tot is working on now! Of course she’s doing quite a bit of other things too. Like I mentioned, you’re welcome to see her full curriculum list in our 2014-2015 curriculum post. Unless otherwise indicated in the post, all of the activities can be found in my K4 Kindergarten Curriculum. I also have a lot of free kindergarten worksheets on my free printables page! I would be interested in the higher number sheets!!! I’m interested in the higher numbers sheets as well. We have enjoyed using your LOTW and K4 activities this year. Thank you so much. 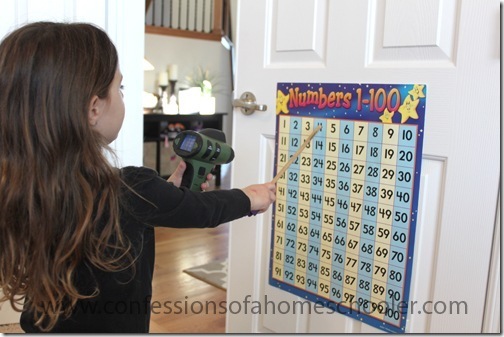 I’d also Love the higher number worksheets!!! Thanks SO MUCH for your dedicated hard work!!! 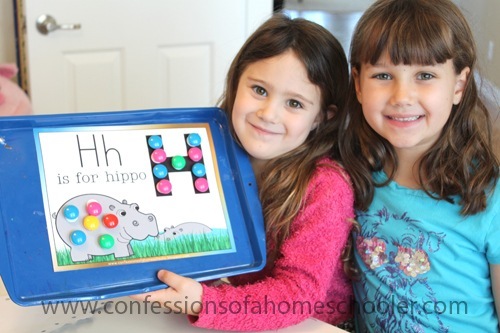 For the letter matching game (hippo), did you make or buy the letter chips? How about some apple number sheets with skip counting, by 2’s or by 5’s? I think that would be great! I would like some higher counting sheets. I also like the idea of skip counting pages by 5’s and 10’s for sure. I just bought this curriculum for the fall so maybe you already have that in there. I do have to say we have loved doing your LOTW curriculum and are looking forward to K4 kinder! Higher numbers would be great! The new calendar pages will come out in May or June. They’ll be out in time for next year, you can always download the daily learning pages and print out everything except the calendar pages if you’re trying to get things prepared ahead of time. Love your website — what program did you use to set it up?